Apache Spark puts the promise and power of Big Data and real-time analytics in the hands of the masses. With that in mind, let's introduce Apache Spark in this quick start, hands-on tutorial. This is an introduction to Apache Spark Part 1 of 4. Part 1 Intro to Spark, how to use the shell, and RDDs. Part 2 Spark SQL, Dataframes, and how to make Spark to work with Cassandra. Part 3 Intro to MLlib and Streaming. For the full abstract and outline please visit our website Apache Spark QuickStart for real-time data-analytics. On website you can also find many more aticles and tutorials such as; Java Reactive Microservice Training, Microservices Architecture | Consul Service Discovery and Health For Microservices Architecture Tutorial. And much more. Check it out. Apache Spark, an open source cluster computing system, is growing fast. Apache Spark has a growing ecosystem of libraries and framework to enable advanced data analytics. Apache Spark's rapid success is due to its power and and ease-of-use. It is more productive and has faster runtime than the typical MapReduce BigData based analytics. Apache Spark provides in-memory, distributed computing. It has APIs in Java, Scala, Python, and R. The Spark Ecosystem is shown below. The entire ecosystem is built on top of the core engine. The core enables in-memory computation for speed and its API has support for Java, Scala, Python, and R. Streaming enables processing streams of data in real time. Spark SQL enables users to query structured data and you can do so with your favorite language, a DataFrame resides at the core of Spark SQL, it holds data as a collection of rows and each column in the row is named, with DataFrames you can easily select, plot, and filter data. MLlib is a Machine Learning framework. GraphX is an API for graph structured data. This was a brief overview on the ecosystem. To download Apache Spark go here, and get the latest pre built version so we can run the shell out of the box. Right now Apache Spark is version 1.5.0 released on September 9, 2015. To find the line with the most amount of words in the RDD linesWithSpark, do the following. Using the map method, map each line in the RDD to a number, and look for spaces. Then use the reduce method to look for the lines that has the most amount of words. We can easily cache data in memory. For example, lets create a RDD textFile from the text file README.md available in Spark, this file contains lines of text. 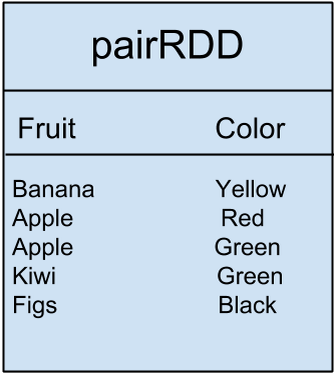 When we read the file into the RDD with textFile, the data will get partitioned into lines of text which can be spread across the cluster and operated on in parallel. The count 98 represents the amount of lines in the README.md file. We can execute a groupByKey() transformation on the fruit data to get. If you like to delete the RDD linesWithSpark from memory you can use the unpersist() method. We introduced Apache Spark, a fast growing, open source cluster computing system. We showed some of the Apache Spark libraries and frameworks to enable advanced data analytics. We showed a glimpse of why Apache Spark is rapidly succeeding due to its power and and ease-of-use. We demonstrated Apache Spark to provide an in-memory, distributed computing environment and just how easy it is to use and grasp. Come back for part 2. We dive in deeper in part 2.